Released in 95, NBA Live 96 is a pretty modern, well crafted, really expansive basketball game; it offers you the chance to play with 29 different teams, with nice, easy to grasp controls, a feel that takes a whole lot of cues from arcade games of the sort, but enough gameplay modes and enough material to really get a thorough experience out of it. The controls are mapped on very few buttons; just the directional keys plus two others. Thus, it doesn't take a whole lot to learn the game, and it plays very well, very satisfyingly. The team will position themselves, on the field and different teams have different strategic approaches; however you can choose to create a different strategy too, as you have these options, though for sure, this is not a high stakes strategy game. It's all very playable, very well produced, and overall, the way it feel and plays is really top notch. 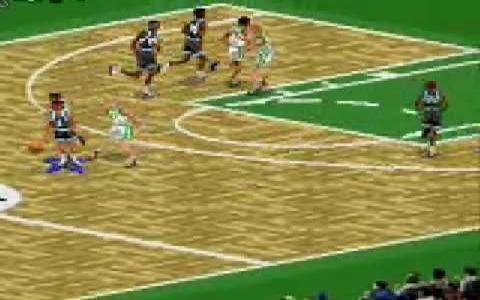 So, NBA Live 96 is a great basketball game, well crafted, and always exciting to look into. It can give you a relaxing but also an involving play, and, compared to, say, NBA Live 2005 the very modern version of the game, it still feels pretty sweet and playable. It just depends on what type of graphics you want, 3D, modern and sprawling or 2D yet well crafted.